Heros von Borcke holds little interest to students of the Civil War today, judging from the books being written, names dropped in conversation, and that I did not know of his existence until three years ago. Despite being practically ignored by most, this man was the favorite adjutant of General Jeb Stuart and received a special commendation from the Confederate States’ government after suffering his nearly fatal wound following the Confederate victory at Chancellorsville in 1863. He was also at General Stuart’s side when this great general perished from the revolver shot he received at the Battle of Yellow Tavern. His memoirs of the Civil War, Memoirs of the Southern War for Independence, make for great reading. He loved his service for the South so much that he would often fly the Confederate Battle Flag from his castle in Prussia. Would that not be a sight to see in Germany! Many of our dear readers are likely astounded by the phrase “his castle in Prussia.” Von Borcke, who would eventually become known as “Von” to Stuart, “the giant in grey” to the general public, and “Major Armstrong” to the enlisted men, came from aristocratic stock. Around the beginning of 1862, he took leave of the 2nd Brandenburg Regiment of Dragoons and arrived in the South on a blockade runner in May, carrying with him an arsenal of a shotgun, four revolvers, and a broadsword boasting a 36 inch blade. (Now held in Richmond’s Museum of the Confederacy.) Jefferson Davis, when he saw the size of von Borcke’s sword and the size of von Borcke (Depending on who tells it, between 6′ 2″ and 6′ 4″ tall and between 240 and 300 lbs), said that with such a sword wielded by such a strong arm, he had nothing to worry about. 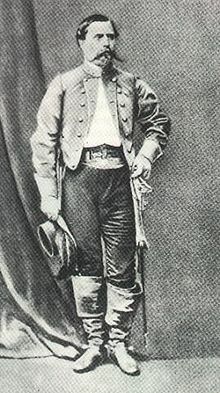 Von Borcke would get to know Generals Jackson and Stuart quite well and give great service until his wound took him off the battlefield for the rest of the war. Complications from this wound would eventually cause his demise in 1895 at the age of 59. So, von Borcke wrote a detailed, intimate, and exciting memoir in much better English than one would expect from a foreigner. Fans of the Civil War, particularly of Stuart’s campaigns, must read this book!